The family friendly hotels of Kuala Lumpur provide guests with spacious accommodation and convenience for public transportation. Some of the best hotels here have earned top marks because of affordable room rates, and they are close to some of the country’s most famous landmarks like the Aquaria KLCC and the Petronas Twin Towers. In addition, there are theme parks like Berjaya Times Square and Sunway Pyramid. Real kid friendly hotels in Kuala Lumpur will boast an impressive range of facilities for children of every age. It will include game rooms, swimming pools, water slides and mini playgrounds. Meanwhile, adults can take full advantage of the saunas, the 24-hour fitness centres and the classy rooftop bars. A Nickelodeon hotel, this is the first Nickelodeon theme that has land in Asia. 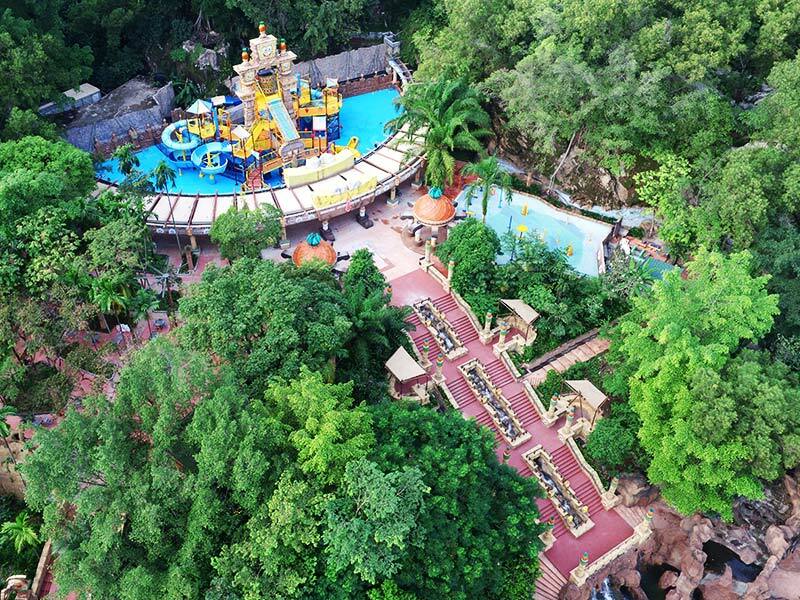 It is set on more than 10 luscious acres of tropical rain forest, and the park resembles the hidden world of a jungle that has been lost to the public. Some of the attractions include a Rain Fortress, a Giant Aqua Tube Ride and a Water Spray Area. Along with this water theme park, you also have restaurants and retail shops themed by Nickelodeon. Some of the hit properties include themes around Spongebob Squarepants, Teenage Mutant Ninja Turtles and Dora the Explorer. A five-star hotel that provides couples with relaxation and rest while the layout looks so clever that it preserves the privacy. Luxury and seclusion have become a huge hit here, and there are shallow ponds that have greenery in all shapes and sizes. In a way, it feels a lot like an island resort, but the most noteworthy aspect of this hotel is how close it sits to Berjaya Times Square. Here you have a shopping mall, many food choices, a yoga center and a kid’s playground that keeps everyone occupied. Another five-star hotel that Shangri-La designed, it is located opposite of Suria KLCC, and the Petronas Twin Towers can be found here. In an unparalleled location, some of the amenities include free WiFi, a business center, five meeting rooms. This hotel becomes a prime location for people who want to relax in the thicket of the action. You have a 34-story hotel, which boasts a 1.3 kilometre jogging track, and it has a pool with a gym, sauna and spa. If you decide to stay at Traders Hotel, be sure to check out the Sky Bar, which is the city’s top rooftop bar. With the pedestrian bridge, you will be connected to Suria KLCC mall, and you will have access to the KL Convention Centre. Kuala Lumpur has a dose of cultural charm that will with tons of Chinese history lessons and early exposure to another culture. Another fact is that Kuala Lumpur is actually one of Asia’s most active metropolises, and you will enjoy a blend of different cultures and religions. Also, you have a lot of affordable and tasty street food like Indian, Chinese and traditional Nyonya. The bottom line is that Kuala Lumpur has a lot to offer tourists.